To remain competitive in today’s global economy, North Carolina must become more connected by investing in modern transportation infrastructure. Congressman Butterfield supports maintaining and improving all modes of transportation from highway and rail to airports and seaports. The First District is strategically located on Interstate 95 and is close to major ports such as Wilmington, and Norfolk, Virginia. A connected North Carolina provides job opportunities, strengthens commerce, and creates a stronger global economy. 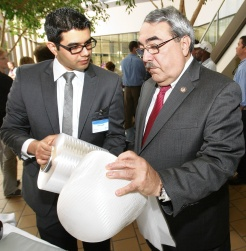 Congressman Butterfield is working with colleagues from both parties to find solutions to transportation challenges. Dwindling sources of fossil fuels, rising gas prices, increasing transportation demand, and an outdated transportation funding system are some of the many difficulties we now face not just in North Carolina, but across the country. Congressman Butterfield introduced the 'Talk Before You Toll' Act, which would ensure that the North Carolina Department of Transportation (NCDOT) and the Federal Highway Administration (FHWA) fully consider public opposition to the tolling of Interstate 95 in North Carolina. This legislation is in response to the concerns that the Congressman shares with many people in his district -- Tolling would be too great of a burden on working families. Congressman Butterfield also introduced the Road to Opportunity And Development (ROAD) Act (H.R. 4829) to designate two North Carolina highways as a “future interstate” that would originate in Raleigh, North Carolina and travel through Rocky Mount, Williamston, and Elizabeth City, North Carolina to Norfolk, Virginia. The ROAD Act will help connect eastern North Carolina to our state’s Capitol and to one of the country’s premier ports in Hampton Roads. His vision to advance transportation in the region will reduce traffic congestion, improve access, and pave the way for job creation and further economic development in North Carolina and Virginia. Congressman Butterfield strongly supports other modes of transportation including rail and aviation. He has long advocated for improving passenger rail service and deploying high-speed rail in North Carolina. He has been a leading advocate for aviation and has helped protect air traffic control towers at airports in Kinston and New Bern which are integral to public safety. In 2013, Congressman Butterfield helped the City of Goldsboro secure a $10 million Transportation Investment Generating Economic Recovery (TIGER) grant for a major transportation project that will provide greater access to the region. Stay informed on this and other important issues by signing up for our newsletter.